Any feedback on how I can improve this is appreciated. Looks great, Jim! Obviously lots of thought and planning went into the set-up and it shows. That looks fantastic, Jim. I loved how many angles you are able to achieve with that set up. I’d like to see what the cards look like when they’re spread on the table face up. The light is bright. I’m wondering if you’re able to clearly see the faces of the cards or if they’re over exposed. Have you posted information on how to book time with you for lessons? 1. Where did you get the base? 2. Where did you get the lights? 3. Are you using an external mic or the one in the iPhone? 4. What are you using to edit the video? Nice job Jim, and well thought out. If you can, Mike Powers also has an incredible set up. He's lectured for the forum and I believe he explained his set up. Thanks Rudy! Yes, I post a link to the booking information. 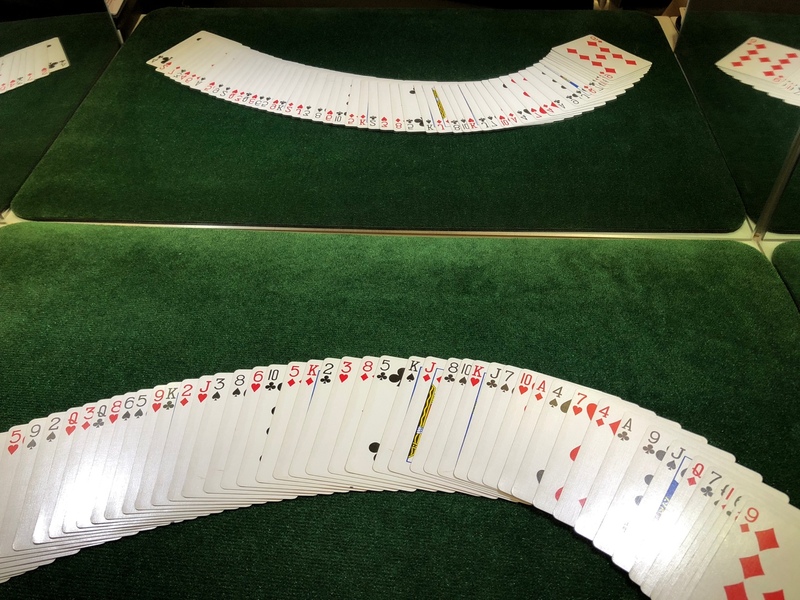 …I’m wondering if you’re able to clearly see the faces of the cards or if they’re over exposed. They seem to show up well, but there is a little reflection if the light in directly on the cards. Second photo is with the lights pointed down. SnakeClamp.com (also where I got the arms). The one on the iPhone, but I do have a Blue Yeti mic that I am experimenting with. Final Cut Pro on the Mac or LumaFusion on iOS. What mirrors did you use? I had mirrored acrylic sheets custom cut to fit my close-up pad. The service I use is TAP Plastics. Right now they are held together with Gorilla tape. When I can afford it, I'd love to have John Gaughan make a frame to hold them. There's a guy out of TX that makes beautiful mirrors, among some wooden effects. Joe Anderson. There's a gentleman by the name of Jack Diamond. He's good friends with Wes James. Jack sells a set of mirrors for magicians. He also has a Mathematica program that tells you what angle to set the various mirrors at to see what you'll look like to spectators at various angles. I think there are protractors on the mirrors for an easy set up. You determine what angle your hypothetical spec is at and then set the mirrors. You'll see what it looks like to that spec. I think a video cam is a better yardstick, though. Just put the camera where the spec is going to be sitting. Furthermore, it's difficult to perform a sleight or routine while you're watching in the mirror. The video cam allows you really become a spectator and watch after the fact. This is a wonderful idea. I could see this as useful not only for your lectures but as an amateur I can see the utility in this for mirror practice for myself. Standing in front of a mirror only really shows an audience angle. Having the sides as well would be a great asset for close-up work. Thanks Mike! I've contacted Wes about getting in touch with Jack. I've been experimenting with a GoPro camera clone (it's a Sony) strapped to my chest, so the viewer sees my pov. Wow! Now THAT is an amazing testimony! !